Kullu is Himachal Pradesh is paradise for tourists, pilgrims, photographers and those who just want to be isolated from the rush of the cities. You can reach Kullu via Bus or Air. There are numberless Events and Places in Kullu that make it Heaven on Earth, I will list a few of them so that you can come to know about them. The facilities for adventure sports such as hiking, trekking, paragliding, river rafting, fishing, mountaineering, etc are abundant here. Let’s start with temples and then we will cover all areas. There is a numberless list of temples/Pilgrim Places in Kullu but I am writing down some of the famous places which are most visited. a.) Bijli Mahadev Temple: It is said that the “Shiv Linga” of the temples is broken by the lightning every year and the priests of the temple gather all the parts of the Shiv Linga again and attach it again with Sattu and Butter. This is why this temple is called as Bijli Mahadev Temple. One can travel to this temple by car or by trekking. However, roads till temple are not possible to construct as the God does not allow so as said by locals. You have to trek to this place after deboarding from the vehicle. b.) Manikaran: Manikaran is located 42 Kilometers from Kullu in the lap of Parvati Valley, Its a holy place for Hindus and Sikhs as it has home stories associated with it. It is believed that Guru Nanak visited this place and they prepared langar with the hot water which is boiling from earth. 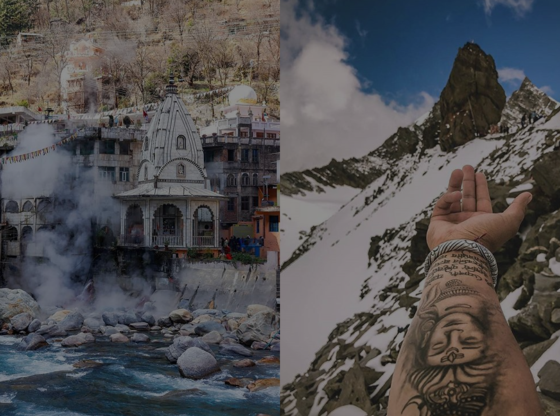 According to Hindu belief Once while roaming through the valley, Shiva and Parvati came across the place called Manikaran and they decided to stay for some time. During their stay here, Goddess Parvati lost her Mani (precious stones) in the waters of a stream. She asked to retrieve it back however they could not find it and Lord Shiva opened his third eye. Sheshnag hissed thereby giving rise to a flow of boiling water. The water spread over the entire area resulting in the emergence of precious stones of the type Goddess Parvati had lost. Finally, they had what they lost and blessed this place. The water of hot springs here is considered Sacred. c.) Shrikhand Mahadev: Shrikhand Mahadev, one of the toughest pilgrimages in India, is known for Lord Shiva in Hindu Mythology. It is suggested that one should visit this place during June and July as food and medical facilities may not be available before or after these months. The journey starts from Jaon village, 170 km from Shimla and 200 km from Kullu. d.) Hidimba Devi Temple, Manali: Beautiful temple of Hadimba or Hidimba Mata in Manali is an example of historical wooden and rock cutting work. Dedicated to Goddess Hadimbi (wife of Bheem, one of the five Pandava brothers of epic Mahabharata), it was constructed way back in 1553. In the memory of Raja Bahadur Singh, the king who constructed this temple, a festival is organized in Sharavn Month of Hindi calendar. a.) International Dussehra Festival: Dussehra of Kullu is different from other parts of India, Is starts from Vijaya Dashmi whereas, in other parts of India, Dussehra is the end of Navratri Festivals. All the local Devtas gather in the Dussehra Ground and from that day, fair starts. b.) Phagli Fair Kullu: This festival is celebrated in Jamula Temple in Malana, as a victory of Sage Manu and Sage Shandilya over Demon Tundi Rakshas. This festival is a unique celebration of good over evil. During the festival, wearing yellow barley grass on one’s clothing is customary and greeting fellow revelers involved offering this grass. The specialty of yellow barley is that it is grown entirely in shade. One of the numerous legends associated with the festival is the story of the demon Tundi Rakshas. According to this legend, Tundi Rakshas was troubling the people of the villages Mala and Archhandi. The villagers prayed to Shandalya Rishi, who, in turn, called on the local god – Jamlu devta – who finally killed the demon. During the Phagli fair, all the villagers from the nearby villages of Jana, Malana, Halan and Soil, get together and worship Jamlu Devta to commemorate this event. Irrespective of class or caste, everyone gathers together during the festival and there is an exchange of ideas along with entertainment and trade which is the staple in any fair. I will write a different blog soon covering all the treks from individual districts. Click Here to read about all the activities in Kullu. Here I am ending this blog, I know I may have missed any famous activity or place, if so please write down in the comment section also write down your comments for suggestion. (Photographs used are the copyright of Photographers, Please visit our Instagram Page to see proper credits.